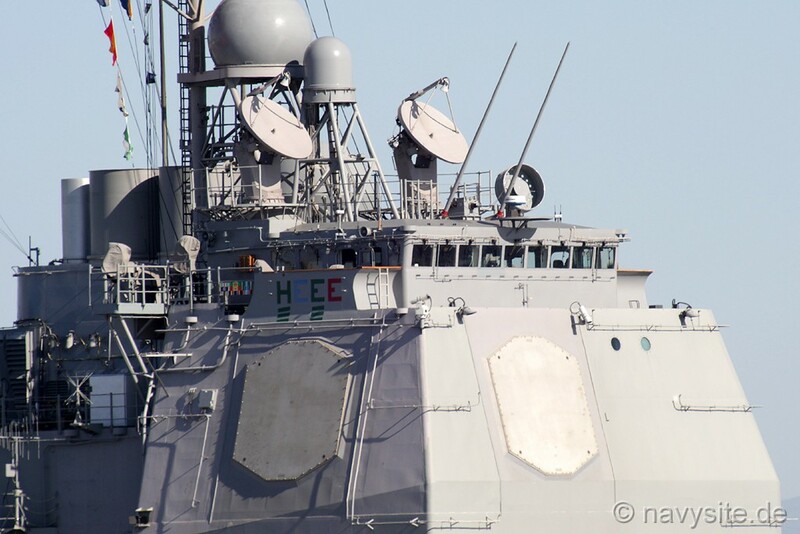 USS LAKE ERIE is the 24th Guided Missile Cruiser equipped with the AEGIS weapons system and the eighth TICONDEROGA - class cruiser built by Bath Iron Works in Maine. She is the second ship to bear the name. This section contains the names of sailors who served aboard USS LAKE ERIE. It is no official listing but contains the names of sailors who submitted their information. 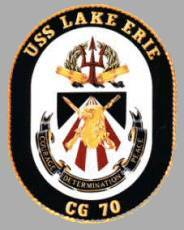 Click here to see which USS LAKE ERIE memorabilia are currently for sale on ebay. Red, white and blue are our National colors. The blue alludes to water; the nine red and white sections combine to suggest the US fleet action of the Battle of Lake Erie. The naval sword and musket, crossed to imply strength and cooperation, are combined with the American Eagle to depict defense of, and devotion to, country. The carronades are emblematic of the American firepower that was so decisive in the Battle of Lake Erie. The olive branches symbolize peace, achieved and maintained through strength and military preparedness. The trident, red for courage and valor, is a traditional naval symbol that typifies an AEGIS cruiser's capabilities on the surface, subsurface, and in the air. 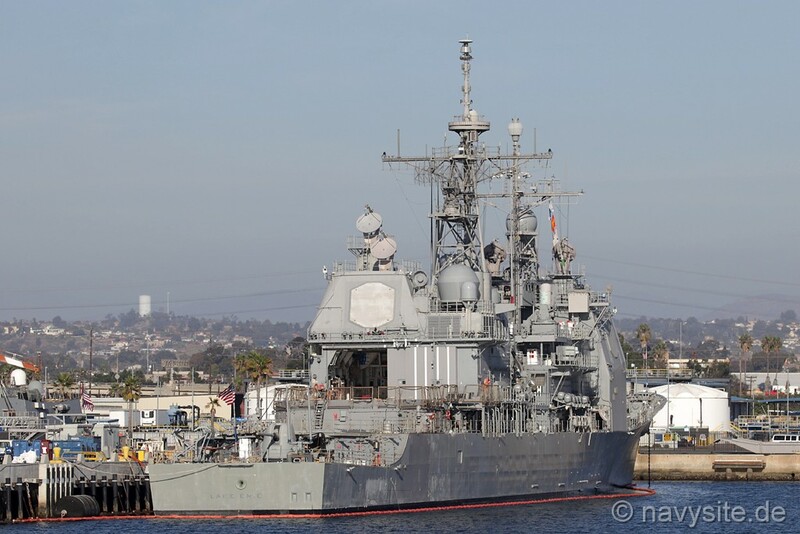 USS LALKE ERIE was built by Bath Iron Works in Bath, Maine. Her keel was laid on 6 March 1990 and she was launched on 13 July 1991. 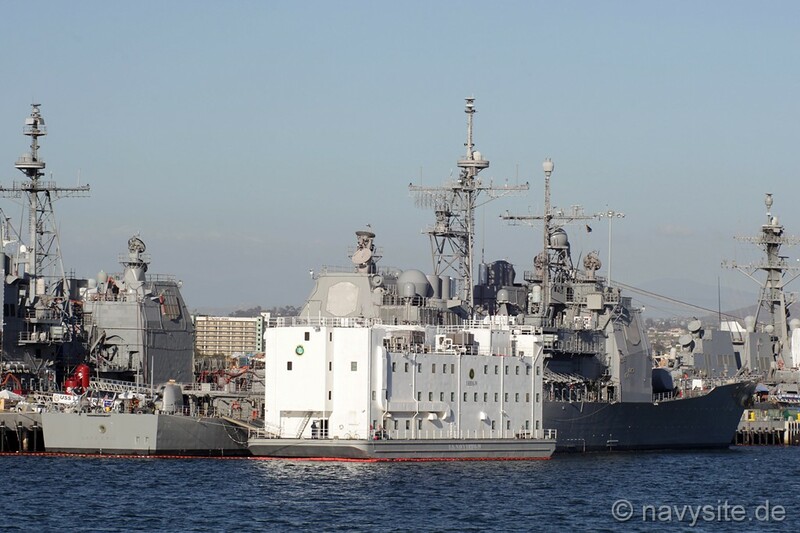 Upon completion of her sea-trials after construction, LAKE ERIE transferred to the Pacific Fleet and was commisioned on 24 July 1993 as the twenty-fourth TICONDEROGA-class Guided Missile Cruiser in her homeport of Pearl Harbor, Hawaii. As part of a seven ship battle group, led by the aircraft carrier USS CONSTELLATION (CV 64), USS LAKE ERIE entered the Arabian Gulf, on January 11, 1995. 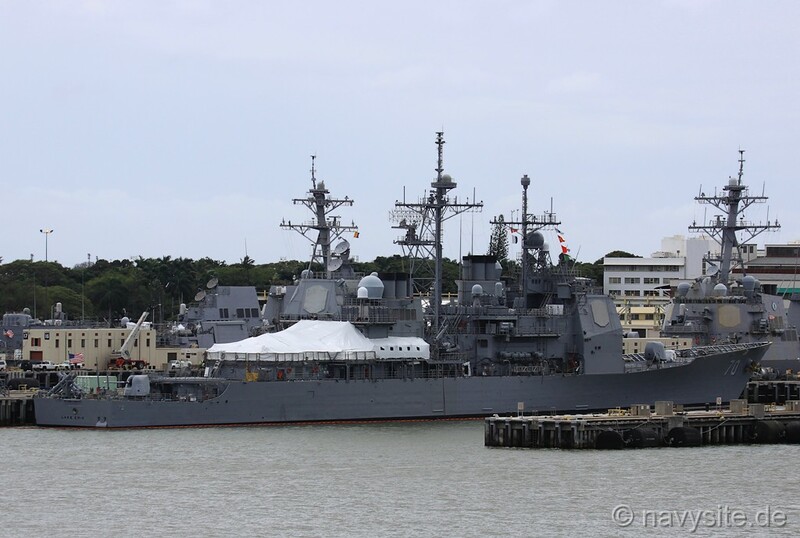 The CONSTELLATION Battle Group deployed on November 10, 1994, and spent most of December in the western Pacific. The battle group's arrival strengthened U.S. presence in the gulf and supports U.N. initiatives in the region, including Operation Southern Watch. 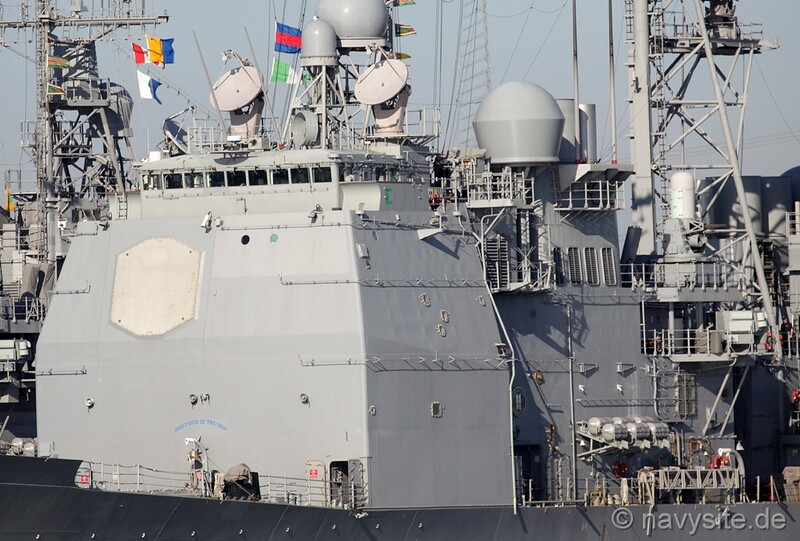 In March, USS LAKE ERIE took part in a two-week, anti-submarine warfare (ASW) exercise in the Persian Gulf and Gulf of Oman (February 5 through 19). The purpose of Exercise Sharem 110 was to gather data and evaluate tactics to counter the growing third-world diesel submarine threat. Throughout the exercise, USS TOPEKA (SSN 754) simulated a diesel submarine, while USS LAKE ERIE and USS VANDEGRIFT (FFG 48) rounded out the surface forces. The first week of the exercises took place in the southern Persian Gulf. The second week was held outside the Strait of Hormuz in the Gulf of Oman. 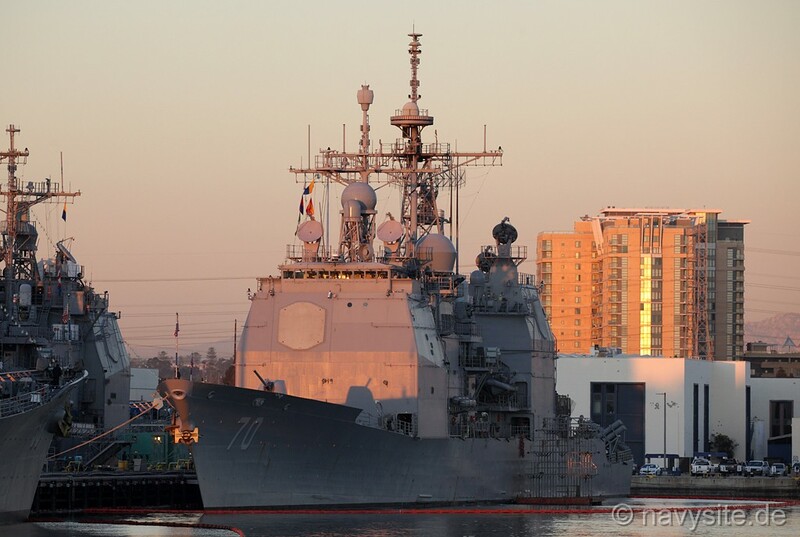 The ships of the CONSTELLATION Battle Group returned to their home ports in May. 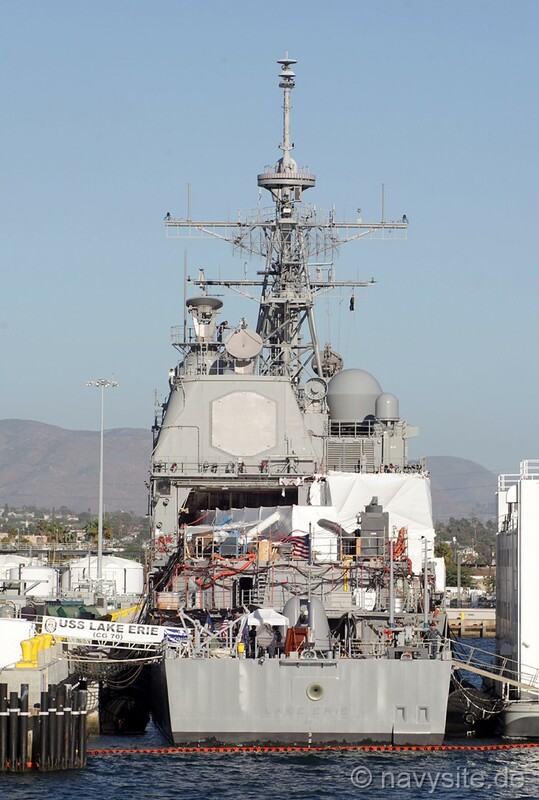 USS LAKE ERIE took part in Pacific Joint Task Force Exercise (PACJTFEX) 97-1, from February 10 through 21, 1997 off the Southern California coast. PAC JTFEX 97-1 is part of a series of exercises previously named "FLEETEX." The new name reflects the increasing focus on preparing naval forces for joint operations with other U.S. military services. 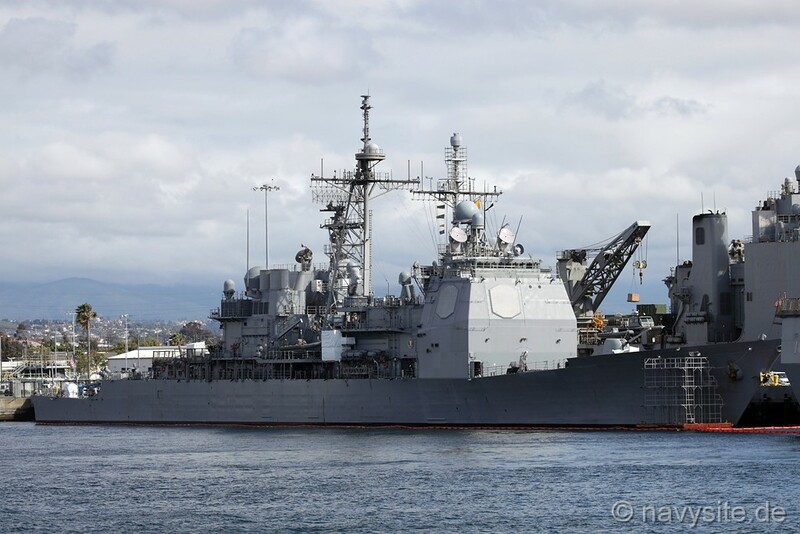 During a deployment with the CONSTELLATION Battle Group, USS CHOSIN (CG 65) turned over the duties of being regional Air Defense Commander to USS LAKE ERIE in July 1997. 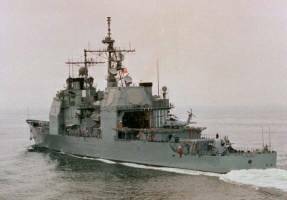 In early August 1997, USS LAKE ERIE was involved in two major Theater Ballistic Missile Defense (TBMD) exercises in the Arabian Gulf named ARABIAN SKIES. During the exercises, the CONSTELLATION Battle Group demonstrated a viable TBMD capability using the existing command and control architecture. 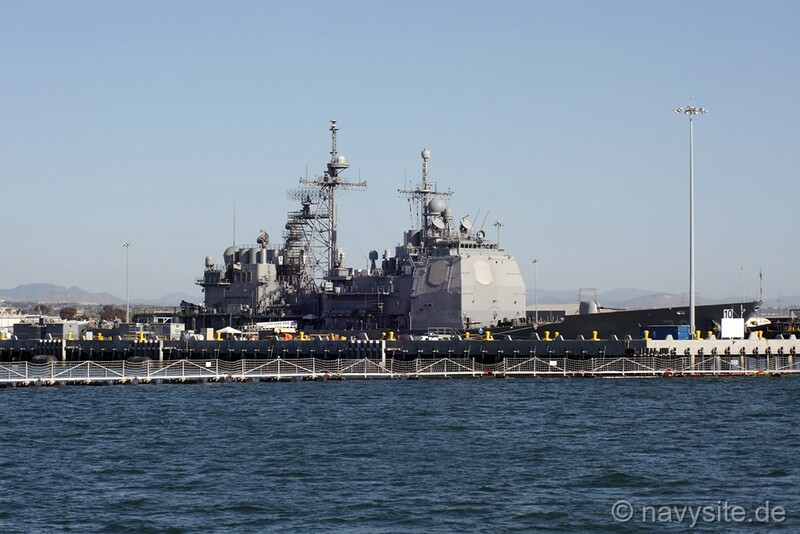 USS LAKE ERIE, with the USS CONSTELLATION (CV 64) Battle Group, then departed 5th Fleet's Area of Responsibility (AOR) on August 17, 1997 on schedule to continue its routine six-month deployment in the waters of the Indian and Pacific Oceans. 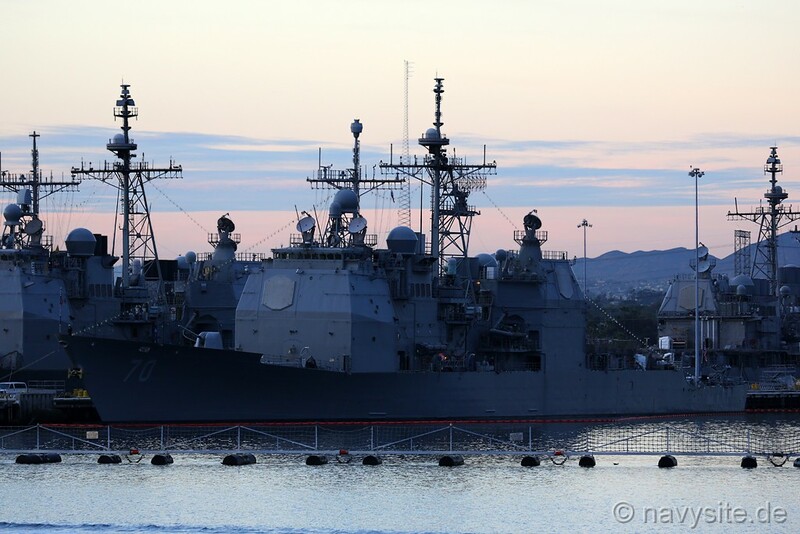 The CONSTELLATION Battle Group entered the Arabian Sea on May 16. After departing the Arabian Gulf, the CONSTELLATION Battle Group concluded its tour in the 5th Fleet with a joint-combined exercise with military forces from Pakistan. Dubbed Inspired Siren 97-2 and Inspired Alert 97-2, the exercises incorporated both surface combatants and air components, respectively. The purpose of this four-day training mission was to exercise the joint-combined naval and air capabilities of both countries, improve their respective levels of readiness and interoperability, and enhance military relations between the two nations. 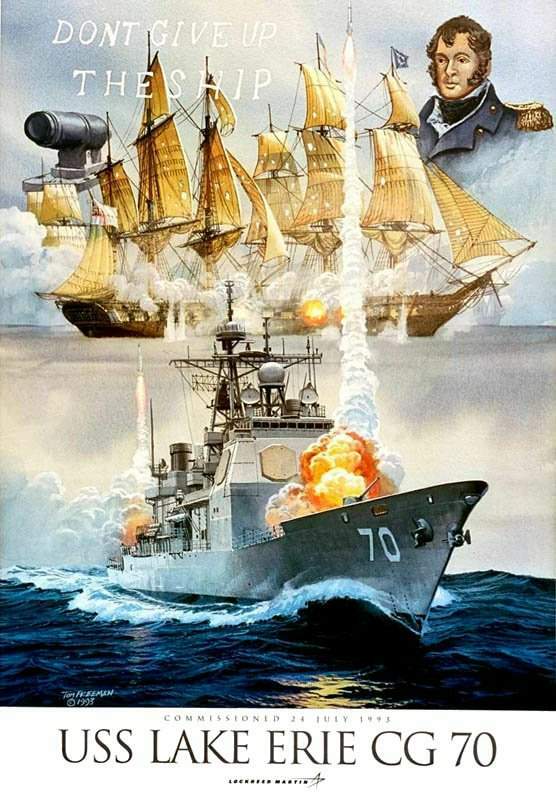 In August 1998, modifications were made aboard USS LAKE ERIE and USS PORT ROYAL, which consisted of modifications to the Aegis weapons system on board TICONDEROGA-class cruisers; a modification, known as linebacker, and which uses specialized computing and radar software and hardware to provide improved tracking and reporting capabilities, and when coupled with the STANDARD Missile-2 Block IVA, intercept Tactical Ballistic Missiles (TBM). Ballistic missile testing afforded Port Royal and other participants an opportunity to flex the capabilities of the current Aegis weapon system against a live ballistic missile target and gave a representation of how the modified system tracks and destroys TBMs. 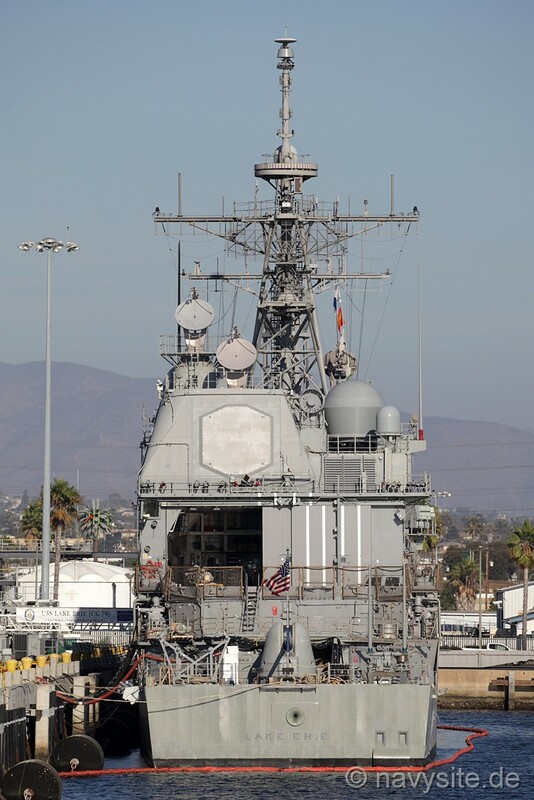 USS LAKE ERIE and USS PORT ROYAL were then to conduct at sea testing, develop core doctrine and tactics, and serve as focal points for putting the TBMD technology in the hands of the warfighters in the rest of the fleet. Sailors on board both ships were also to provide early feedback to the technical community and influence the final design of the TBMD system. Successful LINEBACKER sea trials at the Pacific Missile Range, Kauai, Hawaii took place in the fall of 1998. 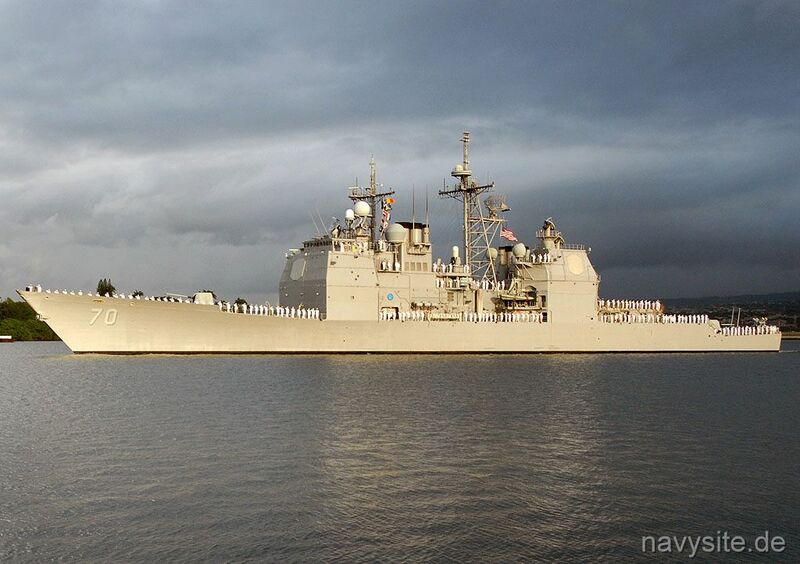 On December 17, 1999, USS LAKE ERIE returned to its homeport at Pearl Harbor Naval Station after completing a six-month deployment to the western Pacific and Arabian Gulf. 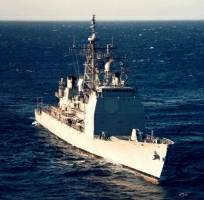 The guided missile cruiser had deployed with the USS CONSTELLATION (CV 64) Battle Group. In March 2000, the US Navy began ALI live fire tests and had successfully conducted the first Controlled Test Vehicle. 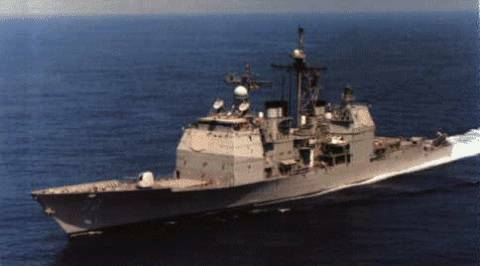 USS SHILOH (CG 67) had conducted the first ALI live firing test in September 1999 and had successfully demonstrated the launch and flight sequence through third stage separation as well as verified flight stability at extreme altitude. 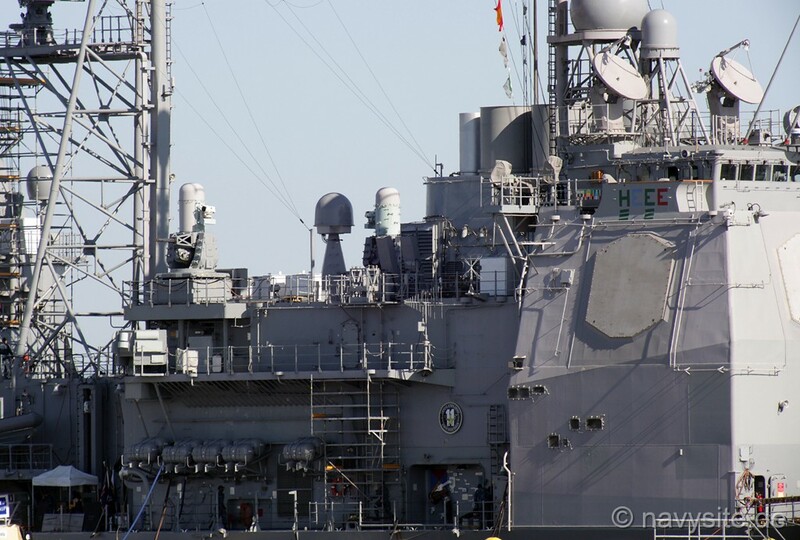 Though the original plan had been to conduct all Flight Test Round shots from USS SHILOH, the need for further testing conflicted with that ship's operational schedule. 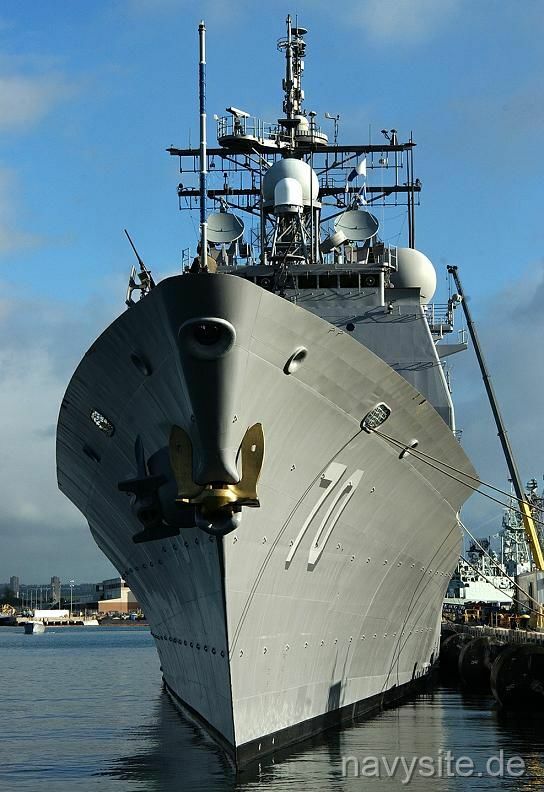 Therefore, it was decided by the CNO to shift to USS LAKE ERIE to conduct the next firings in the ALI testing program. 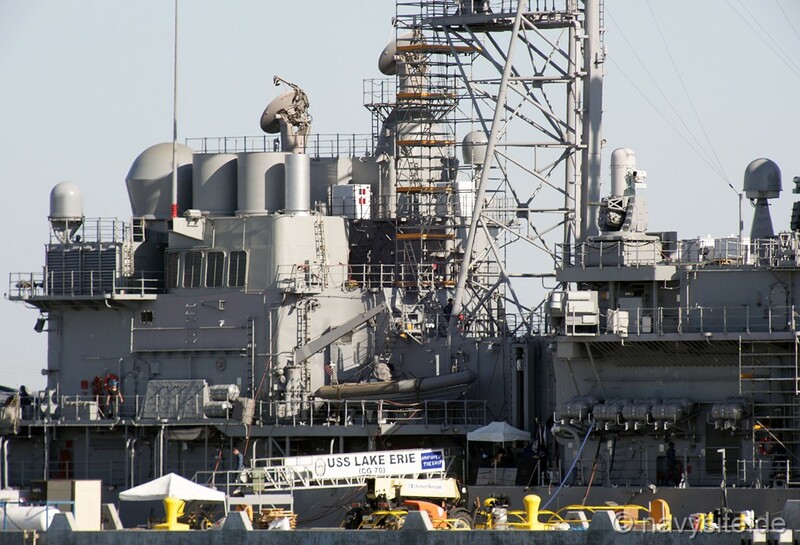 LAKE ERIE, already equipped with Area Linebacker modifications, was, as of March 2, 2000, receiving ALI equipment modifications in Pearl Harbor and was to conduct system checks and training to support the planned test firings. 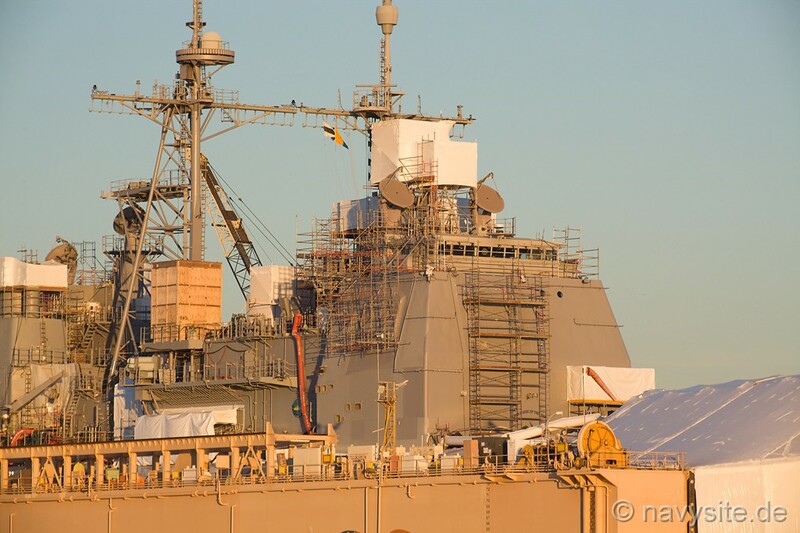 In early July 2000, the US Navy announced that USS LAKE ERIE had been designated the Navy's theater-wide test ship for the AEGIS Lightweight Exoatmospheric Projectile intercept flight-test series. 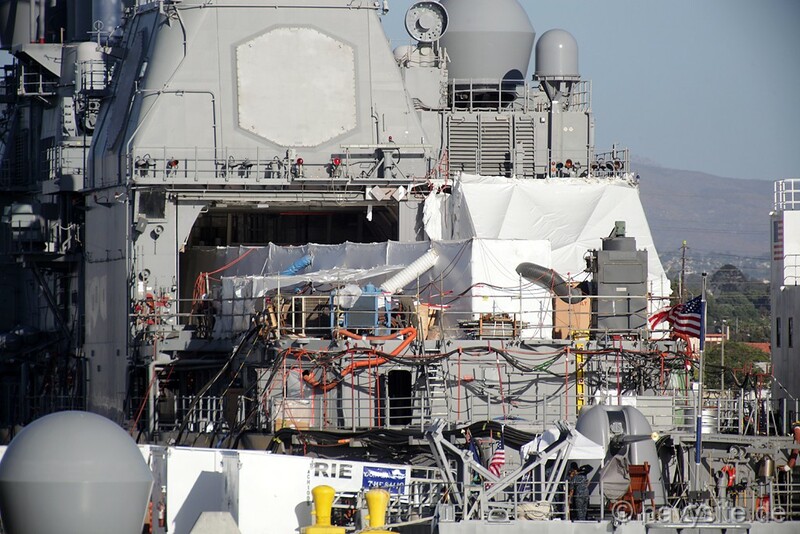 For the next two years, USS LAKE ERIE would be dedicated to conducting these critical tests. 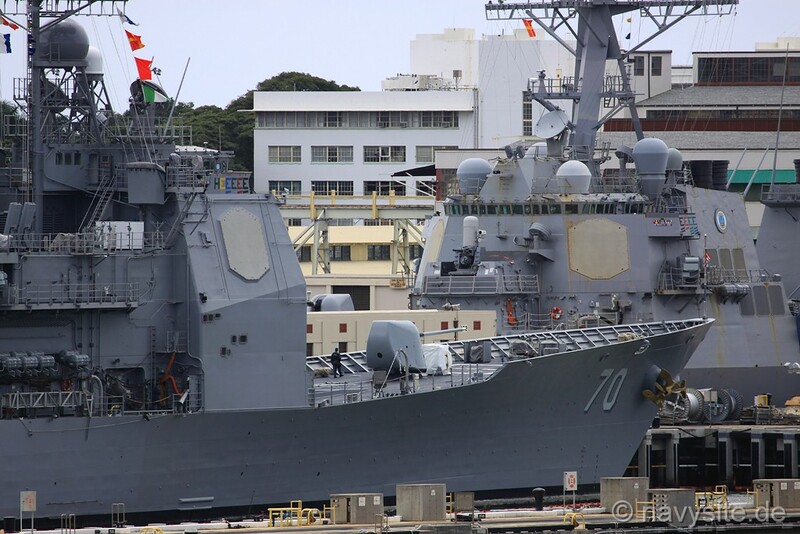 USS LAKE ERIE's homeport in Pearl Harbor, Hawaii, made the ship's participation in tests at the Pacific Missile Range Facility off Kauai cost-effective with the Navy anticipating that the ship would not deploy operationally again for about two years. 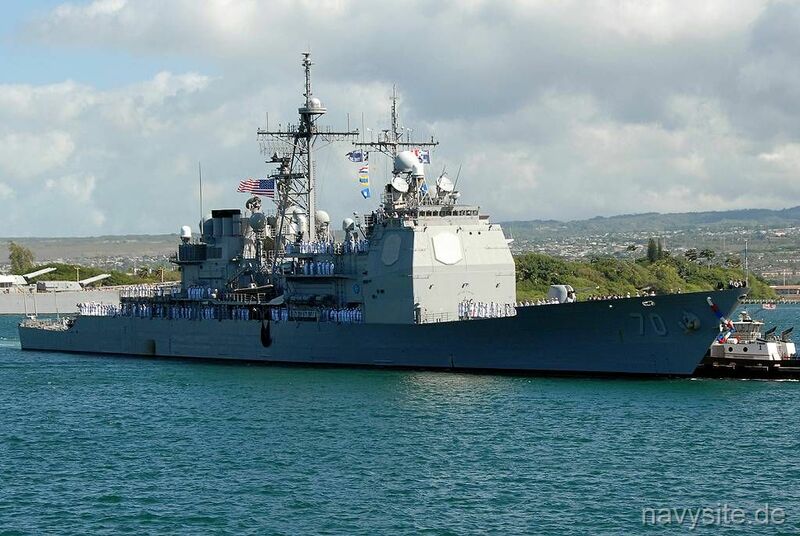 In January 2001, USS LAKE ERIE conducted the Aegis Light Exo-Atmospheric Projectile (LEAP) Intercept Flight Test Round (FTR-1A) mission in the mid-Pacific using the Pacific Missile Range Facility, Kauai, Hawaii. Equipped with Aegis LEAP Intercept (ALI) computer programs and hardware, LAKE ERIE launched an SM-3 missile demonstrating third stage airframe stability and control through nominal kinetic warhead fourth stage separation. The SM-3 is the Navy's new exo-atmospheric missile developed to counter theater ballistic missile (TBM) threats outside the atmosphere. On February 9, 2001, USS LAKE ERIE sortied from Pearl Harbor to assist along with Coast Guard boats and cutters with rescue efforts after a surfacing U.S. submarine, the USS GREENEVILLE (SSN 772), struck a Japanese fishing vessel at approximately 1:45 p.m. (HST) about nine miles south of the Diamond Head crater off Honolulu, Hawaii. The fishing vessel, named EHIME MARU, rapidly flooded and sank within 10 minutes in 1,800 feet of water. Twenty-six of 35 aboard were rescued. The EHIME MARU had been on a fishing and research mission when the USS GREENEVILLE (SSN 772) rapidly surfaced and collided with its stern. The fast-attack submarine was, at the time, conducting an "emergency ballast tank blow," a procedure used to bring subs to the surface in the event of an emergency, although in this case it was used for training, on a one-day cruise with 16 military and civilian guests. On January 25, 2002, the Missile Defense Agency and the Navy conducted a successful flight test in the continuing development of a Sea-Based Midcourse (SMD) Ballistic Missile Defense System (BMDS). Flight Mission-2 (FM-2) involved the launch of a developmental Standard Missile 3 (SM-3) and kinetic warhead (KW) interceptor from USS LAKE ERIE and an Aries target missile launched from the Pacific Missile Range Facility (PMRF) on the island of Kauai, Hawaii. The target was launched at 9 p.m., EST, January 26. About eight minutes later, LAKE ERIE, equipped with Aegis Lightweight Exo-tmospheric Projectile (LEAP) computer programs and equipment, and having tracked the target with the Aegis SPY-1 radar and developed a fire-control solution, launched the newly-developed SM-3. The SM-3 acquired, tracked and diverted toward the target, demonstrating SM-3 fourth-stage Kinetic Warhead (KW) guidance, navigation and control. Although not a primary objective, during this early developmental test, the KW was aimed at the target, resulting in a hit-to-kill intercept at approximately 9:18 p.m., EST. The primary objective of this test was to evaluate SM-3 fourth-stage Kinetic Warhead guidance, navigation and control, with extensive engineering evaluation data collected for analyses in preparation for future flight tests. It was the fourth in a planned series of nine developmental test flights for the SMD program. The mission also included the first fully operational SM-3 with a live Solid Divert and Attitude Control System to steer the KW into the target. Theater Ballistic Missile Defense (TBMD). 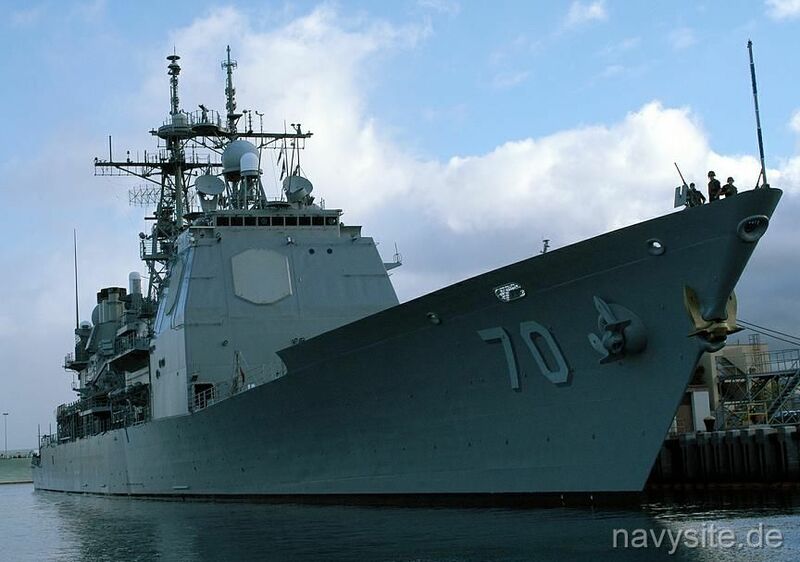 On June 13, 2002, the Missile defense Agency (MDA) and the U.S. Navy announced a successful flight test in the continuing development of the Sea-Based Midcourse (SMD) element of the Ballistic Missile Defense System capability. Flight Mission Three (FM-3) involved the firing of a developmental Standard Missile Three (SM-3) from the USS LAKE ERIE to intercept an Aries ballistic missile target launched for the Pacific Missile Range Facility on the island of Kauai, Hawaii. On November 21, 2002, LAKE ERIE launched a SM-3 missile that intercepted its target three and one-half minutes after the targets launch from the Pacific Missile Range Facility, Barking Sands, Kauai, Hawaii. 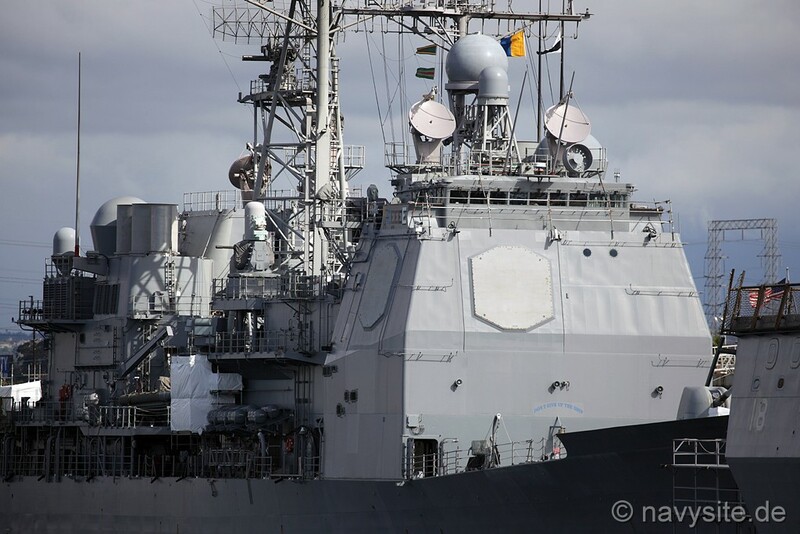 That was the third consecutive successful intercept in the Aegis Ballistic Missile Defense (BMD) program, part of the multi-layered Ballistic Missile Defense System being developed by the Missile Defense Agency. On December 11, 2003, the LAKE ERIE launched a Standard Missile 3 (SM-3) as part of the Missile Defense Agency's Ballistic Missile Defense System (BMDS) test to defeat a medium range ballistic missile threat. The SM-3, part of the Aegis Weapon System intercepted a target launched from the Pacific Missile Range Facility, Barking Sands, Kauai, Hawaii at an approximate speed of 3.7 kilometers per second. The two missiles collided several hundred kilometers from Kauai at an altitude of approximately 137 kilometers. 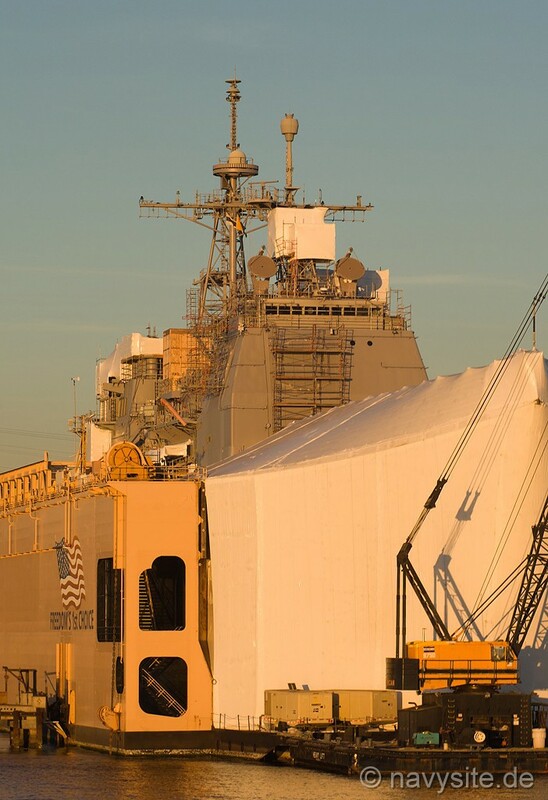 The BMDS test included evaluation of the long-range surveillance and tracking capabilities of two Navy ships, the effective communications between the ships and command and control units in Colorado, and the launch of the SM-3 interceptor. That was the fourth successful intercept for the sea-based element of the BMDS. In June 2004, the LAKE ERIE visited Portland, Ore., to be part of the 97th Annual Rose Festival there. 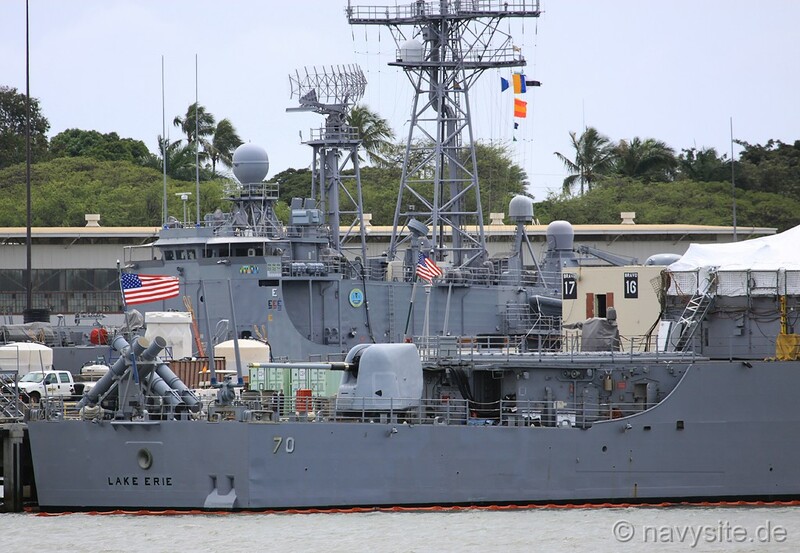 LAKE ERIE subsequently returned to Hawaii to participate in RIMPAC 2004. 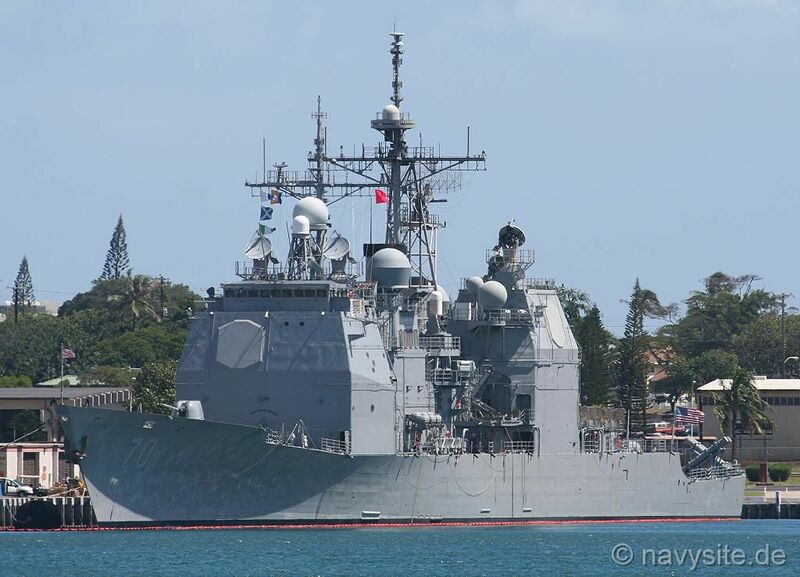 After her participation in RIMPAC 2004, the LAKE ERIE left Pearl Harbor, Hi., in August for a four-month deployment to the Western Pacific in support of the Global War on Terrorism. 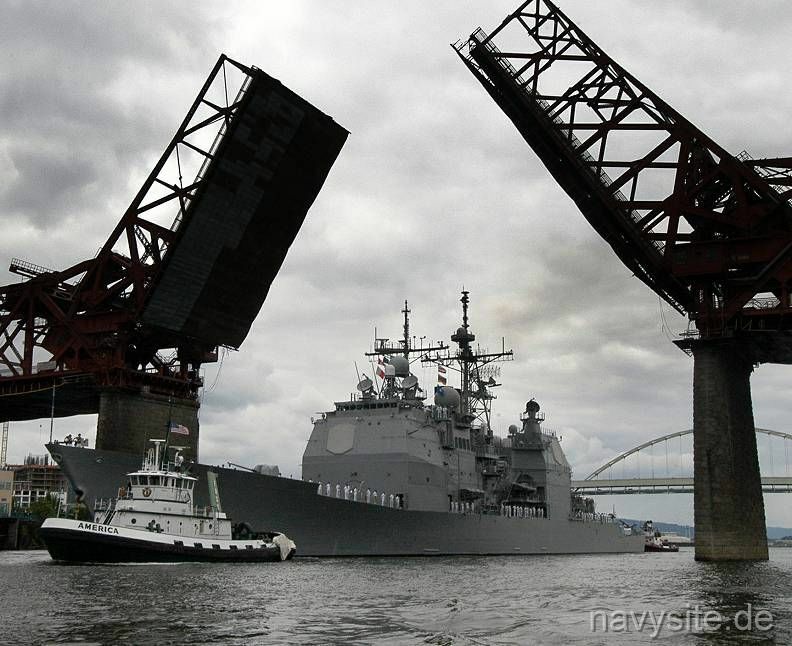 The ship returned home to Hawaii on December 18, 2004. On February 24, 2005, the LAKE ERIE fired a Standard Missile-3 (SM-3) enroute to intercept a short-range ballistic missile target, launched minutes earlier from the Pacific Missile Range Facility, Barking Sands, Kauai, Hawaii. The intercept occurred some 100 miles from the island of Kauai. On November 17, 2005, LAKE ERIE launched a Standard Missile 3 (SM-3) from the vertical launch system (VLS) during a joint Missile Defense Agency, U.S. Navy ballistic missile flight test. Minutes later, the SM-3 intercepted a separating ballistic missile threat target, launched form the Pacific Missile Range Facility, Barking Sands, Kauai, Hawaii. The test was the sixth intercept, in seven flight tests, by the Aegis Ballistic Missile Defense. On March 8, 2006, the LAKE ERIE launched a Standard Missile 3 (SM-3) during a Missile Defense Agency, and Japan Defense Agency cooperative flight test mission. The test entitled Joint Control Test Vehicle-1 (JCTV-1), demonstrated the performance of the SM-3 missile modified with the Japan-designed advanced nosecone and Aegis BMD Weapon System. On May 25, 2006, a standard missile 2 (SM-2) was launched from the LAKE ERIE as part of a U.S. Navy missile defense demonstration. The demonstration, in cooperation with the Missile Defense Agency (MDA), was the first sea-based intercept of a ballistic missile in its terminal phase. A short-range target was launched from the Pacific Missile Range Facility in Hawaii. Shortly thereafter, it was intercepted by the SM-2. Previous MDA / U.S. Navy ballistic missile tests have utilized the Standard Missile-3 (SM-3) to intercept threats in the midcourse phase of flight, outside the Earth's atmosphere. Those tests have resulted in six intercepts in seven attempts. While there is a limited emergency capability available against midcourse threats, there is no terminal phase capability other than the existing Patriot Advanced Capability (PAC-3). On April 26, 2007, the LAKE ERIE once again launched a Standard Missile-3 (SM-3) during a joint Missile Defense Agency, U.S. Navy ballistic missile flight test. Approximately three minutes later, the SM-3 intercepted a unitary (non-separating) ballistic missile threat target, launched from the Pacific Missile Range Facility, Barking Sands, Kauai, Hawaii. Within moments of that launch, the USS LAKE ERIE also launched a Standard Missile-2 (SM-2) against a hostile air target in order to defend herself. The test was the eighth intercept, in 10 program flight tests. 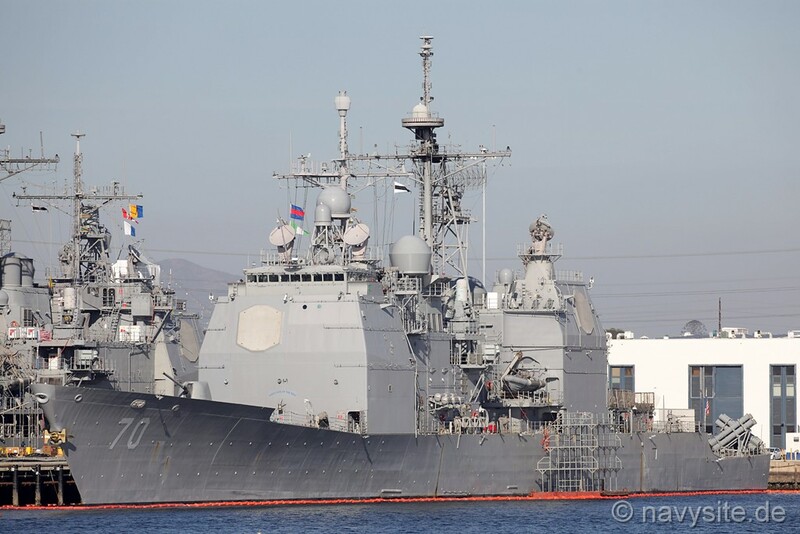 The test was designed to show the capability of the ship and its crew to conduct ballistic missile defense and at the same time defend herself. On May 4, 2007, the LAKE ERIE deployed on a four-month deployment to the Western Pacific. While deployed, the ship took part in Exercise Talisman Saber and escorted aircraft carriers USS KITTY HAWK (CV 63), USS JOHN C. STENNIS (CVN 74) and USS NIMITZ (CVN 68). 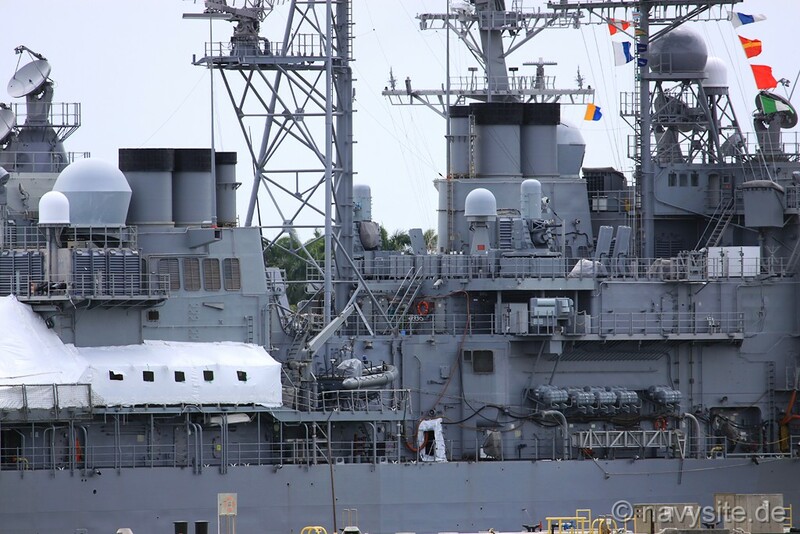 The LAKE ERIE returned home to Pearl Harbor, Hi., on September 4, 2007. 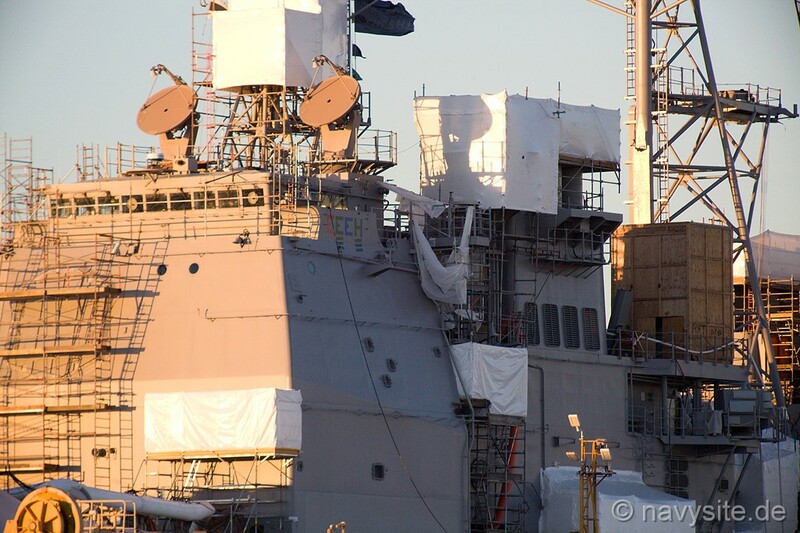 USS LAKE ERIE made another appearance in the news in February 2008, when the U.S. military planned to intercept a non-functioning National Reconnaissance Office satellite which was in its final orbits before entering the earth's atmosphere. On February 20, the LAKE ERIE fired a single modified tactical Standard Missile-3 (SM-3) hitting the satellite approximately 133 nautical miles over the Pacific Ocean as it traveled in space at more than 17,000 mph. At daybreak on September 10, 1813, Commodore Oliver Hazard Perry's lookout sighted Captain H. Barclay's fleet of six vessels northwest of Put-in-Bay, Ohio. With the American Fleet on the lake, the British supply line was cut, and Barclay had to fight or abandon Fort Malden and all the Northwest. When preparing for the battle, both Commanders had two critical factors to consider: guns and the wind. Captain Barclay was armed with mostly long guns; Commodore Perry used mostly carronades. Carronades needed fewer men, could be loaded and fired faster, and their heavier caliber gave Perry a 2-1 firepower advantage at close range, but they had less than half the range of long guns. To use his advantage, Perry would need the 'weather gauge', that is, have the wind at his back so he could choose the distance of battle. Perry's plan was for his two brigs LAWRENCE and NIAGARA to engage the two largest British ships, the DETROIT and the QUEEN CHARLOTTE. Barclay's strategy was to soften up the American brigs with his longer guns before Perry could get close enough to use his carronades. When the nine American ships sailed from Put-in-Bay at 7:00 a.m., the wind advantage was with the British. Perry maneuvered his fleet, but was unable to gain the weather gauge. At almost 10:00 a.m., he decided to engage the enemy when the wind suddenly shifted to his favor. The British furled sails, hove to, and prepared to fight in line of battle. Just before the battle opened, Perry hoisted his battle flag to the topmast. It was a large blue banner with the crudely inscribed words 'DONT GIVE UP THE SHIP'. These were the dying words of his friend, Captain James Lawrence, who was killed in battle in June, and for whom Perry's flagship was named. The DETROIT opened the battle at approximately 11:45 a.m. At 12:30, when Perry opened fire, he thought he had the advantage, but Jesse D. Elliot, Commanding Officer of the NIAGARA, mysteriously kept his ship out of the battle. The now unchallenged QUEEN CHARLOTTE also pounded the LAWRENCE, and by 2:30, four of every five men on the ship were killed or wounded, and all of her guns were out of action. Perry took a small boat to the undamaged NIAGARA and sailed toward the British line. The DETROIT and the QUEEN CHARLOTTE were badly damaged by American carronades. Barclay was wounded and every other British commander was killed or wounded. When they saw NIAGARA coming, the DETROIT and QUEEN CHARLOTTE tried to maneuver into better firing positions, rammed and locked together. Perry broke through the British line, raking the ships on both sides with heavy guns. It was over in only 15 minutes; the British struck their colors. Following the battle, Perry sent his famous message: "We have met the enemy and they are ours." The photo below was taken by me and shows the LAKE ERIE at Pearl Harbor, Hi., on March 14, 2008. The photos below were taken by me and show the LAKE ERIE at Pearl Harbor, Hi., on March 8, 2012. 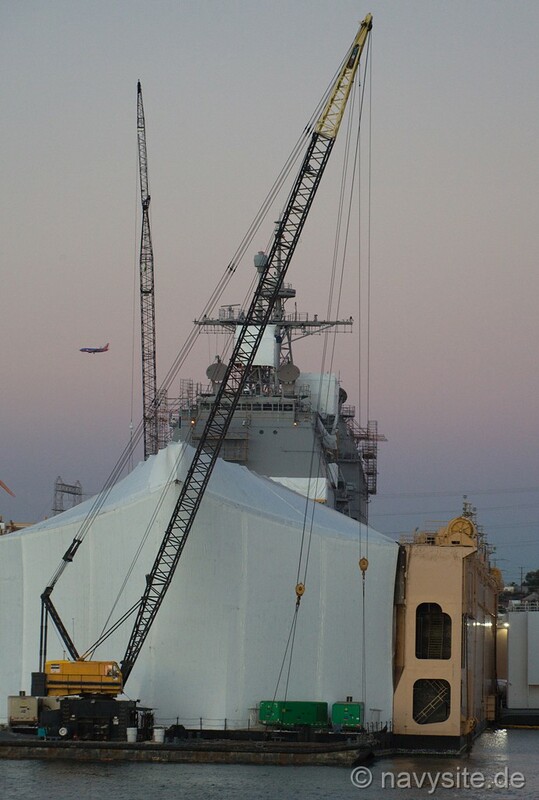 The photos below were taken by Michael Jenning and show the LAKE ERIE at BAE Systems San Diego Ship Repair during her Extended Dry-docking Selected Restricted Availability. The photos were taken on December 27, 2014. 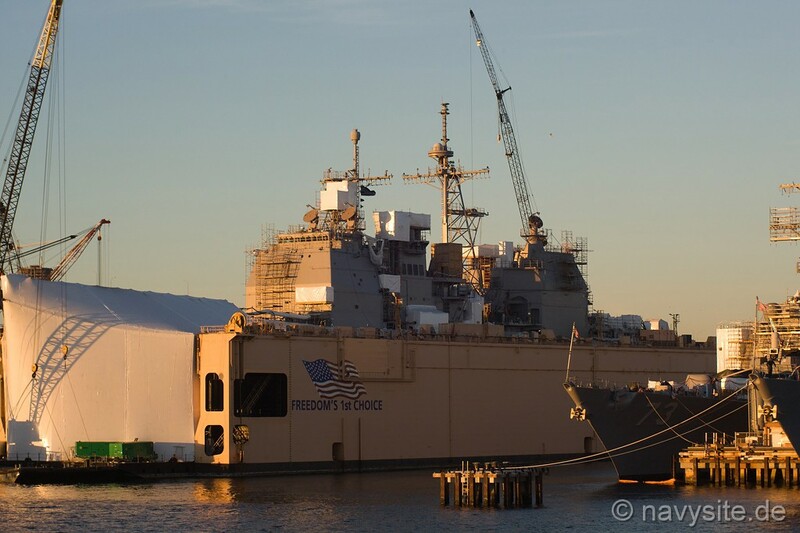 The photos below were taken by Michael Jenning and show the LAKE ERIE at Naval Base San Diego, Calif., on October 2, 2015. The photos below were taken by Michael Jenning and show the LAKE ERIE at Naval Base San Diego, Calif., on April 18, 2016. The photo below was taken by Sebastian Thoma and shows the LAKE ERIE at Naval Base San Diego, Calif., on December 20, 2016. 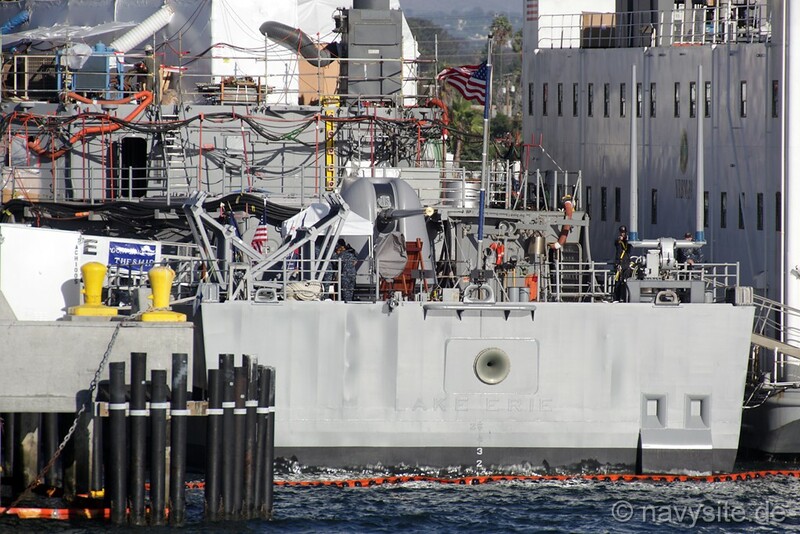 The photos below were taken by Michael Jenning and show the LAKE ERIE at Naval Base San Diego, Calif., on December 29 and 30, 2017. The photos below were taken by Michael Jenning and show the LAKE ERIE at Naval Base San Diego, Calif., on September 28, 2018. 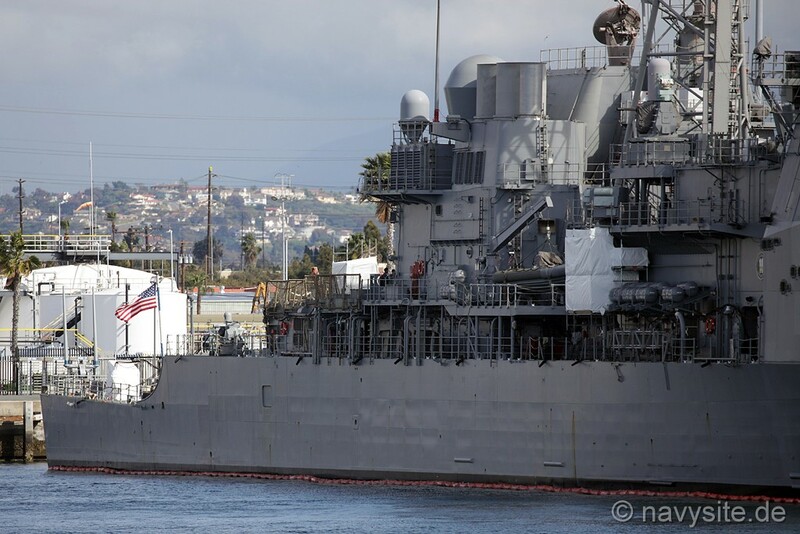 The photos below were taken by Michael Jenning and show the LAKE ERIE at Naval Base San Diego, Calif., on March 2, 2019.